Many feel that God is obscure, distant, and silent. In reality, however, God is constantly speaking. If you want to hear His voice, then its time to listen. For more than twenty years, Dr. Bettie M. Ferguson has been led by the voice of God. In How God Speaks to Me, she leads you to start a relationship with God in which you can begin to hear, discern, and respond to His voice. 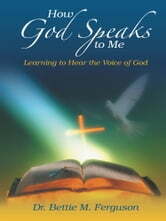 Ferguson reveals how God longs to speak with you and wants to partner with you in every aspect of your life. With love and patience, Ferguson shares her own journey to hearing Gods voice and how it created intimacy with God on a level she had never experienced before. She delves into the numerous avenues through which God reveals His voice as supported by the Bible, shows you how to recognize Him when He speaks to you, and encourages you to open your heart to the transformation He can bring. Its time to find greater devotion to the Lords message. Whether you are beginning your Christian journey or have matured into a fuller stature in Christ, youll be challenged and inspired by How God Speaks to Me. God's Expectations of Us Are Great!